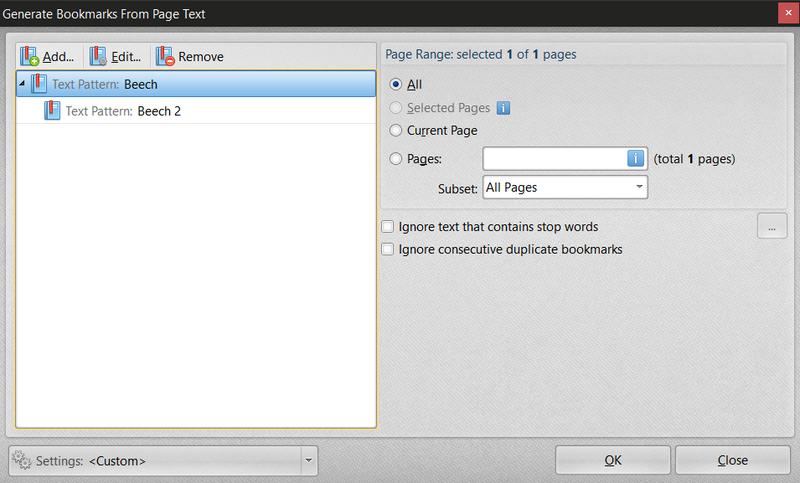 I'm using testing the Generate bookmarks from page text function and it works very well when setting the text matching options to match regular expressions that I have set up. The question I have is if you can have it search for multiple bookmarks at once and deliver bookmarks that aren't nested. If I try to add more bookmarks in the setup window, they automatically nest below the first one. I can save the settings for each bookmark separately. The issue is that I have over 20 bookmarks I'm searching for and it's rather user-intensive to have to switch the settings and search that many times. In Acrobat, I'm able to use the Action Wizard and the Autobookmarking plug-in from Evermap to chug through the file and do all the bookmarking at once. Is there something comparable in Editor? thanks for the post. I see what you mean, at least I think I do. Would it be helpful if the bookmarks could be re-ordered with different levels in the dialogue where you set up your rules? If you set up your rules but could drag the bookmarks around, up and down nested levels as one can after they are created, would that solve the problem? Yes, I think it would. As long as you can have multiple text patterns set as the highest level. While this is internal only, referring to this ticket will allow any staff member to get an update on it's status for you. Creating a feature request is not a promise to deliver said feature, more, it should be considered a strong indication that the feature is being considered for inclusion in the software. Ultimately whether this feature is implemented will be at the discretion of the Development team leader.